Treks in the GHNP - What do you need to know ? How much time do you need ? What to take for the trek ? 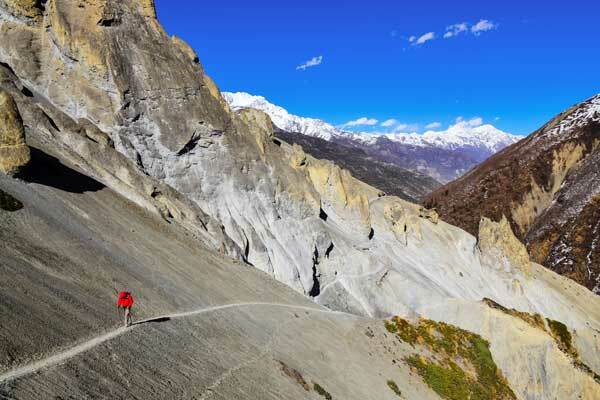 Why to trek in the GHNP ? Unlike other parks in the Himalayas, the GHNP area is completely free of any human activities. It offers unique opportunities for enjoying nature, trekking, and observation of wildlife. The biodiversity of fauna and flora is exceptional. And of course, the park being the realm of nature, the landscapes are untouched, the sceneries are mind blowing. First time trekkers or globe trotters we will offer you a real GHNP astonishment. 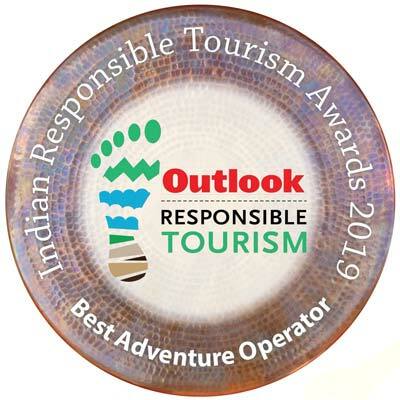 BUT before planning your trek please go through this page in which you will find most of the practical information you need for the best experience. The Great Himalayan National Park (GHNP) is a strictly protected area with no roads, no premises and no facilities of any kind. The only way to visit the GHNP is to go on foot. Two days (one night camping) is the minimum required since the Park gate is at 3 hours walking distance from the road at Gushaini. You will be trekking with our local recognized and most experienced guides, porters and cooks. It is not allowed for individuals to venture alone or even in group without a professional guide and his team. The food on trek is prepared by our staff. You do not need to bring any food with you except some biscuits, chocolates or fruits as a supplement if you wish. Nights are spent under tents. We provide all the required camping equipment for comfortable nights in the wilderness. You have a great choice of camping gears and other useful gadgets. Our porters will carry all the food, cooking ustensils and camping equipment. So you only have to carry your personal gear (mostly clothing). If you don't want to carry your personal stuff, just let's know and we will add a porter to your trekking crew (extra charges). In average, a porter can carry the personal stuff of 3 trekkers (max 7 kg of stuff per trekker) as he can take 21 kg maximum. In the realm of Nature there is no infrastructure. Hence the only way to visit GHNP is to trek with our staff. We provide food and all camping equipment. You need to be reasonably fit and healthy to trek in the park. You have an average fitness? You can easily and quickly climb a 2 story stairs without being left out of breath? You can go for most of our 2, 3 or 4 days trek. In general the longer treks require a higher level of fitness. All our treks are rated in terms of required level of fitness (under the trek features section). It actually starts from 20 (easiest) and goes up to 100 (most strenuous). Someone with an average fitness can go for all the treks rated up to 50. 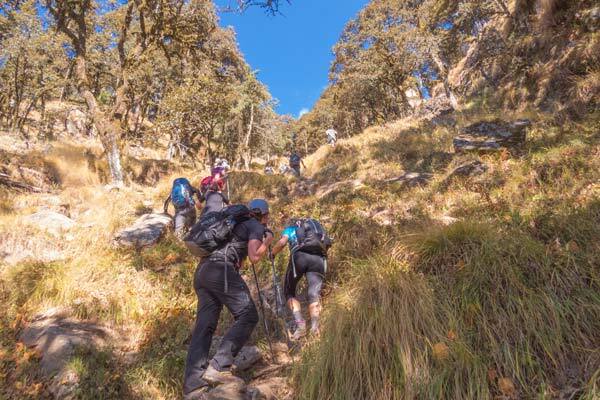 Above 50 you need to be fit enough to face the harsh conditions that you may meet on your trek. Please have a look at the table on the right to rate yourself, and hence assess what you can do or not. 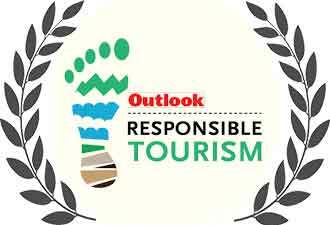 Before booking your trek please fill in this form and send it back to us. If you have any doubt regarding your physical fitness or if you have any known medical problems please ask advise to your doctor. Depending on the age of the kid you can judge what you can do with them. Before 4 years old, the kids have to be carried most of the time. We can give you a baby carrier (up to 20 kg) and even an extra porter to help you out. In case the low age kid is carried you could virtually go anywhere. Between 4 and 6 the kids walk quite well but are quickly tired. So for this age group select the easier trek or our "Easy camping in the wild". From 6 to 8 the kids may have the fitness to go for trek up to 40 in rating. But they may still need assistance. Your trek will be slower. Above this age it becomes a quite personal matter and so the parents only can know the capacity of their children. Although our staff will definitively be helpful the parents are responsible for their children. Any special assistance required, please let us know. On a very steep but short (500 m) slope. The required fitness for this trek is rated 50/100. Your fitness matters in the first place. Average fitness? you are good to go. We will select the appropriate trek for you. Children are welcome. All treks are rated from 0 to 100 for the required level of stamina. 00 to 20 You have a sedentary way of life. A little physical effort will leave you out of breath. You know you have a weak stamina. Why don't you consider our "Easy camping in the wild". 20 to 40 You have a sedentary way of life but you know that you have some physical potentials. Your body is not used to prolonged physical effort but you don't mind walking for about 2 hours on easy paths with gentle slopes. 40 to 60 You may still have a sedentary way of life but you are physically fit. You don't miss an occasion to go on foot or by cycle. You can run for 10 minutes without problems and you can challenge a lift by climbing on foot a three story stairs with speed. You are not in the best shape but you feel confident in most of the situations where your body will be challenged. In short you have an average fitness. 60 to 80 Even if you work in an office you regularly do sport. Physical activities are an important part of your life. You like to surpass yourself by participating in a race, for instance. Prolonged physical efforts in harsh conditions do not scare you. 80 to 100 You are very sporty. You have already tested your body capacities in a challenging mountain environment for several days, at a high altitude. You are confident that you have a very strong stamina to face the unpredictable. Our senior guests are welcome on our treks. But be careful. You may have not noticed that your stamina has weakened these last years. You can try to rate yourself with the help of the above table, but avoid overestimating yourself. It is possible that you are actually 10 or 20 grades lower than what you think. When was the last time you run for more than 5 minutes ? You are above 60 and you are no more very sure about your physical fitness ? We recommend you to take advice from your physician. Two days is the minimum time required since its gate is at 3 hours walking distance from the road at Gushaini. So in one day you can just reach the gate and come back, entering the park automatically involves a multi-day trek. If you don't have even 2 days the only option for you will be to go for a day hike in the ecozone of the GHNP. Although you can go into the GHNP in only 2 days we strongly recommend you to go at least for a 3 or 4 day trek if you wish to have a better experience of the GHNP. Actually only the Rolla trek allows you to cross the Park gate in 2 days. Any other treks in the GHNP require from 3 to 9 days. If you have limited time try to go for 3 days (not 2) so that you spend an entire day in the wilderness and reach more interesting places. 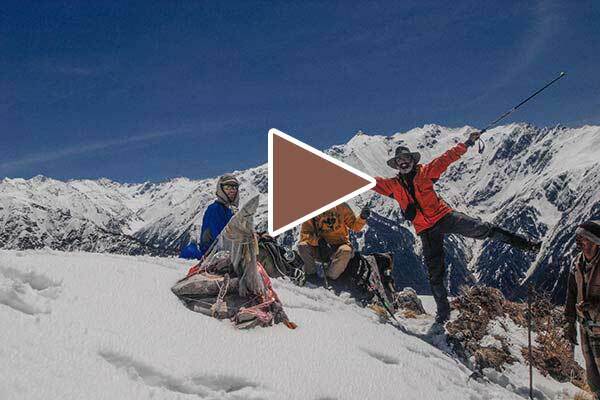 The most popular short treks in 3 days are Marahni/Kundri and Shilt Hut. Minimum 2 days to enter GHNP. We suggest you to go for minimum 3 or 4 days trek for a better experience. We have treks in the GHNP that last up to 9 days. Use the list beside to check all the stuff that you need. You have it, just tick the item. you can erase or re-order the items. Rules of the thumbs ! Always think light weight ! It becomes troublesome to trek with a rucksack that weighs more than 10 kg. Hence it is wise to select all your gears considering the weight. Take a rucksack which is comfortable for you. It should be adjusted to your body height. Be aware that while crossing forest you may damage your clothes because of thorns etc. So avoid pants and other garments that you use in the city. Never start a trek with shoes that you have never used before ! Use them at least for a couple of days before using them for trek. The mountains are much colder that the plains. Don't hesitate taking your warmest clothes. It is wise to check the weather forecast for Himachal Pradesh just before leaving so that you can have a better idea of the weather you will have during your trek. A flask. An empty bottle of mineral water can do the job ! There are fees for entering the Park and additional fees for tents, cameras, video and filming. For Indian nationals the park administration charges 100 rupees per person per day. For foreign national, the entry fee is 400 rupees per person per day. Each tent will also be charged 100 rs per day. There is no fee for still camera. Video cameras for non-commercial use are charged 150 rupees per day for Indians and 300 rupees per day for foreigners. Video for commercial purpose requires permission from the Park Director at Shamshi. Please note that the Park administration changes the Park entry fee from time to time. Enquire with us to get the latest fare. Fee per day per person : 100 INR for Indian and 400 INR for Foreign Nationals. There is also a fee of 100 INR per day per tent. Don't worry about food. Mostly veg but rich, varied and abundant. Be in the wild but like in a restaurant ! 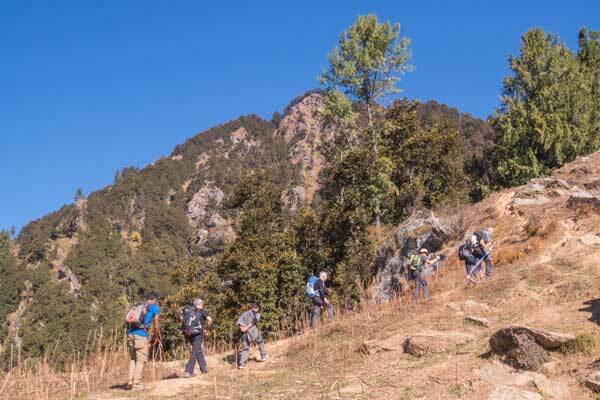 On trek with Himalayan Ecotourism ? You will be amazed by the food we are able to give you in the wilderness, where there is no facilities. Our cooks are excellent and experienced trekkers ! Mostly you will give you traditional Indian food but on your special request we can even prepare some other mountain delicacies cooked with herbs and "real" cheese (continental style). The menu will be vegetarian because meat could get quickly spoiled while carried in a rucksack, and canned meat isn't available here. Nevertheless you can have chicken for the first dinner if you wish. Breakfast : A substantial breakfast with bread, butter, jam, omelet, cereals/porridge a fruit when available. An Indian breakfast is possible as well. Let's know you preference. Lunch : A packed lunch consisting of paranthas or sandwiches, a juice, a chocolate & a fruit. Snacks : A hot snack early evening. Dinner : A rich and varied Indian dinner with rice, chapati, dal, vegetables, paneer or a non-veg dish (first night and on your request only), salad, pickles.